Your kids will love this turkey sausage Stroganoff. It´s a winner on the table, it’s budget friendly and super easy to make. My husband and I used to make this dish frequently long before we had our daughter and knew she would appreciate it. 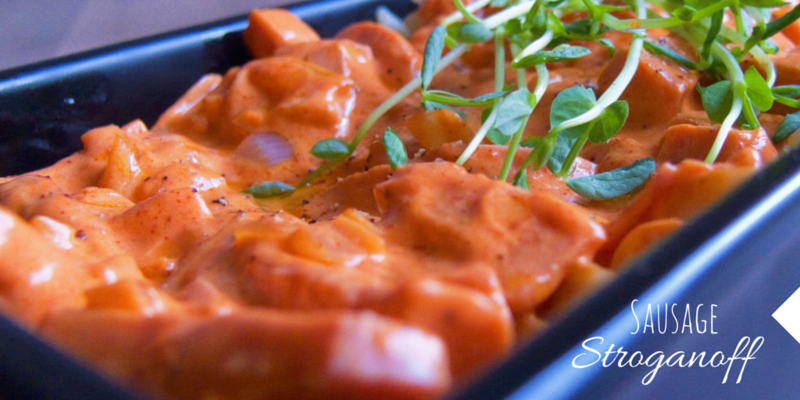 Originally it´s my husband´s recipe and he really knows how to make a good stroganoff. I experimented with the recipe a little, just for the fun of it, and added a drizzle of lemon olive oil. And wow what a pleasant surprise it was, I did not think this recipe could be any better than it already was. Well now it´s your turn to make this dish and tell me what you think. You can serve this stroganoff with rice or mashed potatoes. Both option are equally as good. In a skillet heat oil over medium-high heat and cook sausages for a few minutes until they get some color. Stir in sour cream, paprika and ketchup. Season with salt and pepper and let simmer for a few minutes. Pour the stroganoff over the pasta and drizzle the lemon olive oil over the stroganoff. Decorate with some sweet pea shoots.